Rumors are flying this weekend that Mars Phoenix has made a major discovery relating to the potential for life on Mars. This poem was published in Analog, in May 1977, on the occasion of the Viking lander's ambiguous discovery of maybe-life on Mars. On Mars's frigid desert floor! Seed the globe that now contains us? 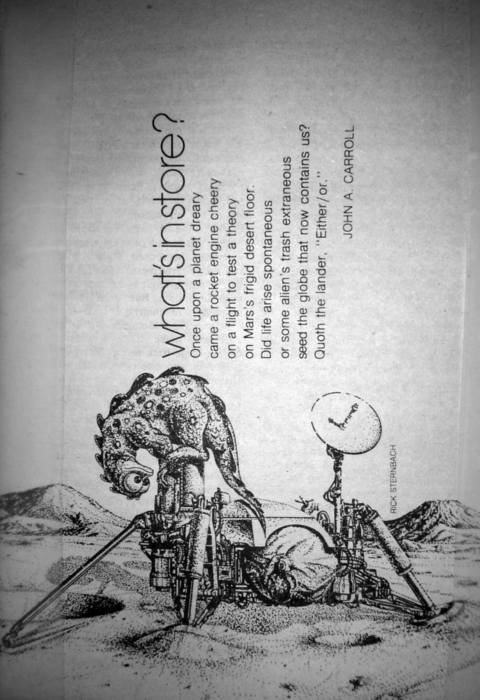 The poem was accompanied by a sketch of the Viking lander with a Foglioesque Martian sitting on top leaning over to stare into a camera. If anyone has more information about the author of this poem, or better a scan of the page, it would be appreciated. I carried a copy around for many years, but it seems to have been lost in a move. A gentleman by the name of Andrew Johnson from Manchester believes it was published in Analog No. 558 (May 1977), and the cover reproduced here rang a bell. According to ISFDB the poem was entitled "What's in Store?" by one John A. Carroll. I was able to acquire a copy. The cover story was oronically by one John Hoagland, who was soon to become famous for the "Face on Mars" hoax. I have taken a preliminary picture of the page containing the poem, [whats-in-store.png].